“Maybe we should go to counseling,” she said in a hushed and hopeless tone. “What?! You think we are that bad off? You think we are ready for a divorce? !” he asked, feeling angry and defensive. Counseling. What is counseling? Why do people go to counseling? Does it really help? How can telling a stranger my problems make them any better? What if I don’t want to talk about painful things? Won’t talking about it just make me feel worse? These are just a few of the questions I have heard over the years. In fact, many couples face a discussion that starts the way the one above sounded. And all too often, counseling is used as a last resort before struggling couples call it quits. But there are a whole myriad of reasons that people seek counseling. I have learned to laugh, because when I am out socially, people ask what I do and when I answer that I am a professional counselor, people get this glassy- eyed look as if to notify me that they are done talking! It’s horrible!! Unfortunately, many people have no idea what counseling is or how it is designed to improve mental health. What you may not realize is that talking to a counselor is probably the least judgmental person you could ever talk with! Click & Tweet! We have seen it all, heard it all, and despite it all, we still develop therapeutic relationships based on the fact that everyone deserves a chance to grow and change. For those healing from what feels like the ugliest, deepest of hurts, we are quite familiar. We have heard dreadful things that just reside in the dark crevices of our brain and are never to be spoken of again (yes, that’s confidentiality…the promise that unless you have a plan to harm someone or yourself, what you share with us can never be shared). Sometimes, there can be a bit of a stigma surrounding the concept of counseling. So let’s take just a moment and cover some of the realities of counseling and how it can make a difference. For some, the only exposure you’ve had to a counselor is the guidance counselor as you selected courses in school. For others, you may have had a good or bad experience with a counselor following some life event or tough situation. First of all, there are some different levels of mental health professionals. Let’s get an idea for where each one fits. Psychiatrists are the doctors (with an M.D.) that diagnose and prescribe medications. They have specialized training in medications for mental health issues. They may do counseling, but tend to focus on major issues. Psychologists are the doctors (Ph.D. or Psy.D.) that are involved with testing and assessing of individuals to get diagnoses for issues that usually meet criteria for mental disorders. Professional Counselors/Therapists are the masters level professionals that don’t prescribe or do formalized testing but deal with the issues through counseling methods. States have different regulations for whether counselors must be licensed or not. Licensed professionals have to take ongoing education and pay to keep a professional license active every two years and must maintain a status with the state for regulatory accountability. Counselors may choose to work within specialized fields (such as with families, alcohol and drugs, or addictions) or with a specific population (such as play therapy, adult, couples, adolescents, etc.). For many reasons, but some include marital distress, anxiety, depression, addictions, parenting issues, past victimization, sexual assault, low energy and motivation, anger issues, unresolved conflicts, tension in the home, difficulty focusing, trouble communicating needs, reoccurring conflicts in a relationship, personal dissatisfaction, grief, loss, trouble adjusting to life changes, ongoing life stresses, difficulty connecting with a child, divorce, loss of job, and many, many more! What do you do in counseling? You typically cover some issues surrounding what brought you to counseling, such as what you are experiencing, how long has it been going on, how it affects you and your life. 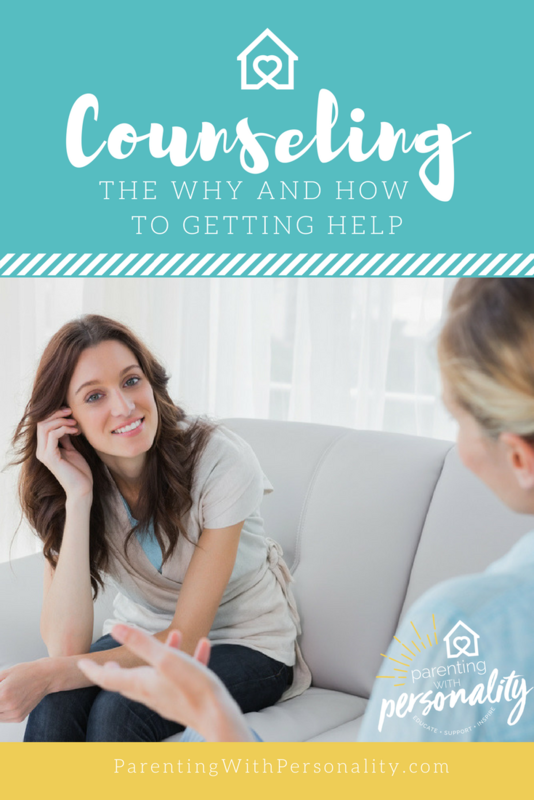 Based on different counseling approaches, the counselor gets a sense of what you are experiencing, what might be some of the issues at play, and decides what the situation may need. Through conversations, a treatment plan is put together and different methods employed to treat the issue. Methods may vary according to the counselor and their opinion of what might be most beneficial for your specific situation. Give it time. Don’t be too hasty to think it isn’t working. They say making a new habit takes 21 days, so give things time to start growing and changing before you try to determine the effectiveness. Counseling gives us a professional with fresh eyes for the situation. The counselor brings a new and trained perspective, but also one that is not tainted with emotion for the situation or people involved. (Have you ever shared something with a family or friend and then wished later you hadn’t, because they struggled to let it go!?) Counselors keep what you share in the strictest of confidence and can not even tell another party if they are even seeing you. They are trained to hear themes in what a person discusses. They also can suggest other methods of coping, communicating, and approaching issues, no matter how difficult, painful, or challenging they may seem. They can help you rehearse new responses and learn new ways of handling tough situations physically, emotionally, and mentally. A counselor can help you see where you have been, where you are, where you want to be, and be the key to helping you get there. Won’t talking about something painful only make it worse? Absolutely not, in fact, we often say that the only way through it is through it! So your counselor can help you walk through even the most difficult of situations and can help those details become less painful, traumatic, or debilitating. They are trained in utilizing methods that others are not aware of. These methods allow them to help you not retain the level of hurt or trauma that you may have been carrying prior. Great question! I tell the couples that I do pre-marital counseling with that counseling should always be an option. If a couple decides that counseling is a tool and not a last resort, than both parties can feel less defensive when it is brought up. Click & Tweet! Likewise, for any individual, counseling is a tool that we can keep for any time that we need help or support to navigate issues that are tripping us up. Counseling is a great option for anyone who is carrying hurt or trauma, anyone who keeps running into the same issue over and over but can’t figure out what to do, anyone who feels that a tough situation is starting to feel consuming or overwhelming, or anyone that needs new methods to handle a situation that may or may not change. Does counseling really make a difference? Absolutely! In fact, I can say from personal experience it sure can! I believe a good counselor has done their own work (that’s what we call what you do in counseling, because it doesn’t always come easy)! If you have made a good connection with your counselor, put in the time to make some changes, and utilized your time and resources to grow…you can be astonished at the effects it can have on your life. But what if I’ve had a bad experience in counseling? That can sometimes happen. I would encourage a couple things. If you are still working with your counselor, try communicating your feelings, whether you have felt stuck, hurt, or just not connecting. Don’t be afraid to bring up what you are experiencing with counseling. A good counselor wants to know and will discuss how you are feeling and if there might be a different approach that would work better. I must admit that sometimes you just don’t get a good connection. I saw a counselor once that I realized was not a good fit. His methods were not a good fit for what I was needing. So, I was able to move on and find someone that worked better with my desire for the working relationship. And think of it this way… have you ever had a meal in a restaurant that wasn’t what you expected? I’m guessing yes! But it didn’t stop you from eating out, I bet! At times, things don’t go as we wish. We just must make an effort to communicate what we need or find a way to go about getting what we need in an appropriate manner. How do I go about finding the help I need? Reach out and start finding the counselor you need today. Ask a local church, friend, or colleague who they might refer someone to. Word of mouth is sometimes the best way. But if you feel private about seeking help, you can google search for names of therapists or professional counselors in your area (you will hear the two roles used interchangeably). You can also use referral resources such as the Focus on the Family provider referral list or the Psychology Today referral list. These are paid forums that providers may be linked with. Then make a call and ask the questions you need to ask to find the best fit for you and your situation! And if you aren’t sure what those might be, feel free to use the Checklist for Finding A Counselor! Continue to keep appointments and do the work it takes both in and out of session. This gives you your best results!